PNGase F is the most effective enzymatic method for removing almost all N-linked oligosaccharides from glycoproteins. PNGase F is an amidase, which cleaves between the innermost GlcNAc and asparagine residues of high mannose, hybrid, and complex oligosaccharides. 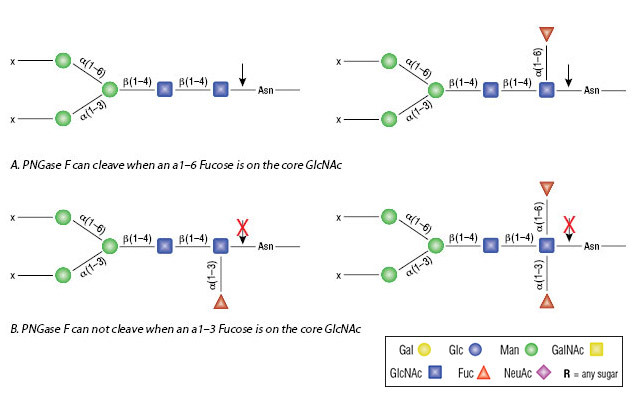 PNGase F is not able to cleave N-linked glycans from glycoproteins when the innermost GlcNAc residue is linked to an α1-3 Fucose residue. This modification is most commonly found in plant and some insect glycoproteins. PNGase F is purified from Flavobacterium meningosepticum (3) and it is free of proteases and Endo F activities. What happens to the asparagine after PNGase removes the sugar? What are the typical reaction conditions for PNGase F?